for my 33rd birthday, i made a list of 33 things to do before i turn 34. i am always so inspired by the lists that andrea, kristin, elizabeth & dani make, so i wanted to give it a whirl this year. 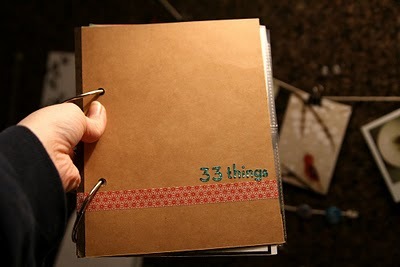 elizabeth, in particular, made an awesome mini book to document her last list. 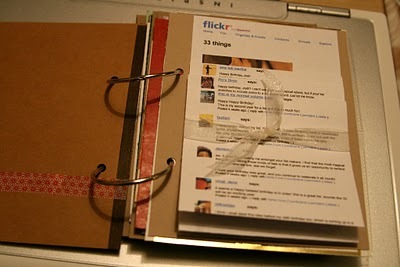 i used to scrapbook a lot, but now that everything is online, i haven't done anything. a mini book seems like just the ticket to get back on the crafty track. so, taking inspiration from elizabeth, her inspiration (elise blaha) and ali edwards' december daily books, here is the beginning of my 33 things book. mostly assembled and waiting for the documentation to begin!